Vibrant Syracuse Spaces received an award from the Green Improvement Fund (GIF) for a green renovation of an impervious unused lot to a parking lot for Gear Factory, Inc., located at 196 South Geddes Street. A 10,000 square foot parking lot was created utilizing porous pavement to capture stormwater runoff. Additionally, the project incorporated capture from the city right-of-way section of the property. Approximately 4,500 square feet of new sidewalk and right-of-way sections were added that include bioretention areas and tree plantings. In total, the Vibrant Spaces project captures an estimated 440,000 gallons annually. The applicant worked closely with both the county and city to maximize the stormwater capture of the project. 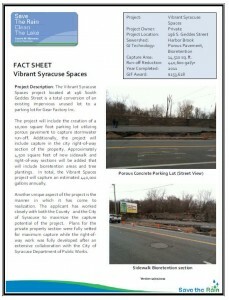 Plans for the private property section were fully vetted for maximum capture while the right-of-way work was fully developed through collaboration with the City of Syracuse Department of Public Works.